At the G20 Mrs May lined up with the various unelected Presidents of the EU behind their comfortable agreement, no doubt much to the satisfaction of the globalist establishment, as they continued their offensive against the People and Parliament of Britain. Yesterday was supposed to have been about international trade, and I was looking forward to someone explaining why remaining chained to the world's most protectionist trade block, which has sclerotic growth, a doomed currency union, and is being outperformed by thrusting, vibrant and free economies across the oceans, would be a good thing for the United Kingdom. It didn't happen, of course. What did happen was a co-ordinated response between May's team and her EU allies. First came Liam Fox on Sky, who urged voters to write to ther MPs saying they did not want to see either 'no deal' or 'no Brexit'. Whoaaa there! Where did that come from? Clearly it was not a mistake, for a little later Donald Tusk, an unelected official serving as one of the EU's several Presidents, said MPs will be faced with leaving the European Union without a deal or cancelling Brexit altogether if they reject Theresa May's deal. There it is again. Brexit will be cancelled unless we do as we're told. So in the past week the Axis forces of May's government and her EU allies have agreed a new attack option. If they don't get their way, they'll cancel the largest and most significant vote ever held in the United Kingdom. I've just caught the tail of a news report that Gove has today echoed (in a column in the Remainer rag the Mail) the above - saying if MPs don't accept May's deal, Brexit could be 'called off'. Clearly this now has legs. The implication is that May is threatening that if she and the EU lose their Commons vote on the 11th, they'll impose another referendum on the UK - and one with 3 options, that splits the Leave vote and is designed to reverse Brexit. Operation Hysteria continued yesterday with a pathetically weak and dithery interview on 'Today' by Ben Wallace, before he left to open the International Handcuff Exhibition. 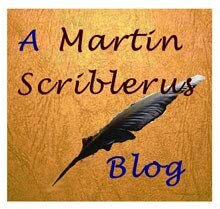 Wallace is a minister who struggles to make his presence felt; he must have endured a multitude of social events with his interlocutor's gaze fixed over his shoulder seeking someone more interesting with whom to talk. 'Today' managed to tease from him that Brexit would end the EU wide security agreement under which we exchanged information. But surely we do this already under a number of bi-lateral agreements that would continue? Well, yes. And there will be nothing stopping a security official from the UK picking up the phone to his opposite number to warn of a threat? Well, No. And neither we or our security counterparts in Europe will stand idle and keep silent about a terrorist or security situation? Well, No. So there will be little difference? It is simply not credible that the UK will leave either itself or other European nations more vulnerable to terrorism by cutting links and co-operation. Brexit or no Brexit, we will share and security and law enforcement professionals in Europe will share with us (except perhaps Germany, which protects herself against the EU by not only having a law that prohibits the export of wealth but also the export of intelligence). What we will escape is the EU laying claim to our formidable strengths in SIS, MI5 and GCHQ, and with a satellite network of our own (the cost of a single year's EU membership) we will stand as a bridge between the US and Five Eyes and the EU. Let us not forget that since the US was enumerated amongst the EU's potential future enemies, we need a fusible link, a filter, that can start to restrict the flow of sensitive defence intel to the EU. Meanwhile, the markets have shrugged-off the economic hysteria just as our C@W friends said that they would. It also emerged that Carney's Halloween figures were 'scenarios' rather than 'projections'. The difference is as follows. Projections are an honest assessment of the economic effects of various Brexit options, given the likely behaviours of the parties and alternatives available. The Bank's scenarios are based upon there being no alternative goods, services, trade routes, sources, contracts, deals and markets other than those lost through no longer being part of the single market, upon the UK not having one single entrepreneur who will be flexible enough to react, nor a single business that innovates, invents or substitutes and nary a government but one that continues to be hidebound with pettifogging EU rules. In other words it's not worth the paper it was printed on. We have moved into an extraordinary position. Mrs May and her cabinet, with the CBI, the FTSE100 and the industrialists of the European Round Table, the EU Commission and all of the UK and Europe's career officials, bureaucrats and unelected functionaries on one side, and facing them in battle the people and Parliament of Britain. We are resisting the most enormous forces pitched into an offensive against us - they have power, wealth, resources and a tame media. What they don't have is democracy, and a Parliament currently showing a bit of spirit. Now she is throwing absolutely everything she's got into a final Blitzkrieg, one last gamble launched in the depths of winter, driving her forces toward Brussels. And despite the distortions and falsifications by that grubby little rag the Daily Mail of Survation polling, a Clean Brexit on WTO terms is more popular with the public than the Robbins Treaty by 41% to 35%. Lord Ashcroft will also be carrying out his own polling nearer to the 11th. Phil Hammond was the first of May's dags off the block yesterday - together with a quivering whine in support from the Bank. However, they shot their bolt with the lies and distortions of Project Fear at the time of the Referendum and now there are few credulous enough to give their silly projections much credence. One hint at the wider co-operation within May's forces came with the Bank's use of the term 'disorderly exit'. It is a phrase not commonly used in English about Brexit, you may think. And you would be right. It is the direct English translation from the German term* for a Clean Brexit and has been lifted straight from a Bundesbank document, according to one commentator yesterday. For a rebuttal of the Hammond hysteria, it would be redundant to repeat some of the most cogent stuff about on the web. 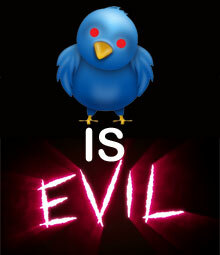 I'd recommend giving our friends over at C@W a look for a telling post and knowledgeable comments on this. The Prime Minister's appearance in parliament yesterday confirmed as nothing else could that the Robbins Treaty will not get through a Commons vote on 11th December. From every side of the house, in refined parliamentary voices, our MPs said "Pish! We don't believe you" as Mrs May struggled to repeat in slightly different ways the same six lies on which she's depended since giving up on "No deal is better than a bad deal". This itself has gone the same way as "Strong and Stable" and others of Theresa's trite little maxims. She is set to tour the country for the next two weeks repeating those same six lies ad nauseum to anyone holding a microphone, and her supporters and Brandon Lewis' office have been sent off to conquer social media. I suspect they've all been instructed to publish six tweets in support of their doomed leader, but judging by their output, their hearts are not in it. Conservative MPs have a finely tuned sense of survival, and by last night they had begun to realise that the game was up. Mrs May is unlikely to survive her coming Commons defeat on 11th December, and her supporters know it. Brandon Lewis, who will fall with Mrs May, has nothing to lose, but others including I suspect James Cleverly, just last week the most prominent of Mrs May's social media warriors, has suddenly gone very quiet. Other MPs have practised for eating-up their Christmas sprouts; some who can't quite bring themselves to repeat Mrs May's six lies have just done their homework by re-tweeting those that can. "What he said". Then running away with proof for the Whips. a Minister of the Crown would be obliged to make a statement under s. 13(4) European Union (Withdrawal) Act 2018 no later than 21 calendar days thereafter. The Government then has seven sitting days within which to move motions in both Houses on the statement. If, on 21 January 2019, no political agreement has been reached regarding the Withdrawal Agreement and/or the framework on the future relationship, a Minister of the Crown must make a written statement within five calendar days, as per s. 13(11) European Union (Withdrawal) Act 2018. This means a written statement as to the Government’s intentions must be made by Saturday 26 January at the very latest. 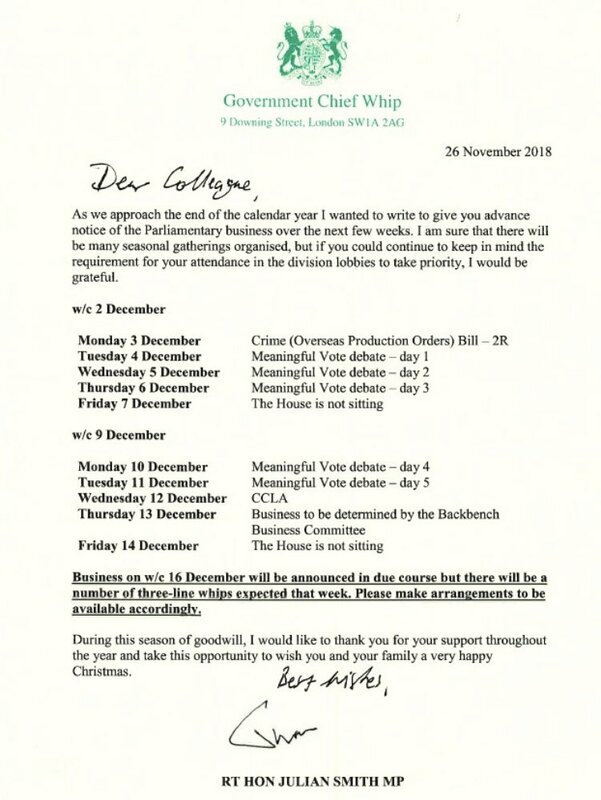 The motion must then be moved within a further five sitting days, meaning Parliament would be asked to debate the Government’s intended course of action no later than Monday 4 February. Now two matters which are being trailled in the press. The first is the extent of the government's defeat, punted by those who believe that it is possible to be a little bit pregnant. If the majority against May is not over 100, they say, it's an invitation for her to ask the House to vote a second time, after she's made a purely cosmetic visit to Brussels to record some encouraging noises, but no actual changes to the WA, from the Commission. The second is what is being billed as the TARP option; between the first and second votes, Hammond and Carney will co-ordinate a crash in Sterling and UK stocks, thus scaring MPs into agreeing the Robbins Treaty in the same way that US Congressmen were frightened into passing TARP on the second go. I think both are unlikely. I think by the 12th, the Conservative Party will be looking for a new Leader - the May government will effectively have fallen. The question is whom will Her Majesty invite to form the next government - for Ministers are needed to get those key Brexit actions through. The EU's strategy in humiliating and beating down the United Kingdom is becoming clear. Aided by a deluded Mrs May, the first stage is to bind, enchain and tangle the UK in a withdrawal treaty that will leave us unable to escape the jurisdiction of the EU and ECJ unilaterally - a treaty that divides mainland Britain from the province, and allows the EU to keep us dangling waiting for a trade agreement. 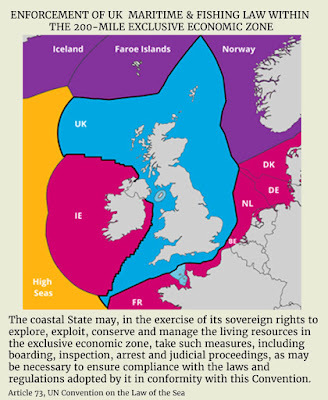 The second stage is to make that trade agreement conditional on the UK giving up its international rights to exploit, manage and conserve the resources of our 200 mile Exclusive Economic Zone. Unless MPs reject the poisonous treaty on December 12th, our nation will be crippled by political uncertainty, corrosive in-fighting, bitterness and resentment within the realm that will continue for at least two years, as like a drowning man we flail desperately to stay alive as a nation while 27 hands are holding our head under the water. Our nation. Our waters. Our rights. 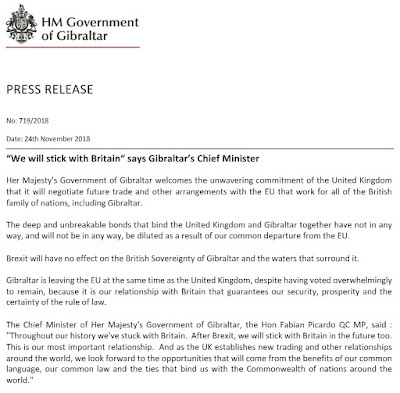 I cannot express too warmly my admiration for the Chief Minister of Gibraltar, Fabian Picardo's reaction to May's docile surrender to the hysterical Spaniards. The Spanish government, with an election in the offing, resorted to crude overwrought rabble-rousing, demanding rights over Gibraltar. May of course was happy to give way to them; after all, having surrendered Northern Ireland to the EU, giving Gibraltar away would be peanuts. Luckily, the Withdrawal Agreement was 'locked', so no legally binding changes could be made. She changed instead the waffle-document, 26 pages of supine abasement by the United Kingdom to the EU. 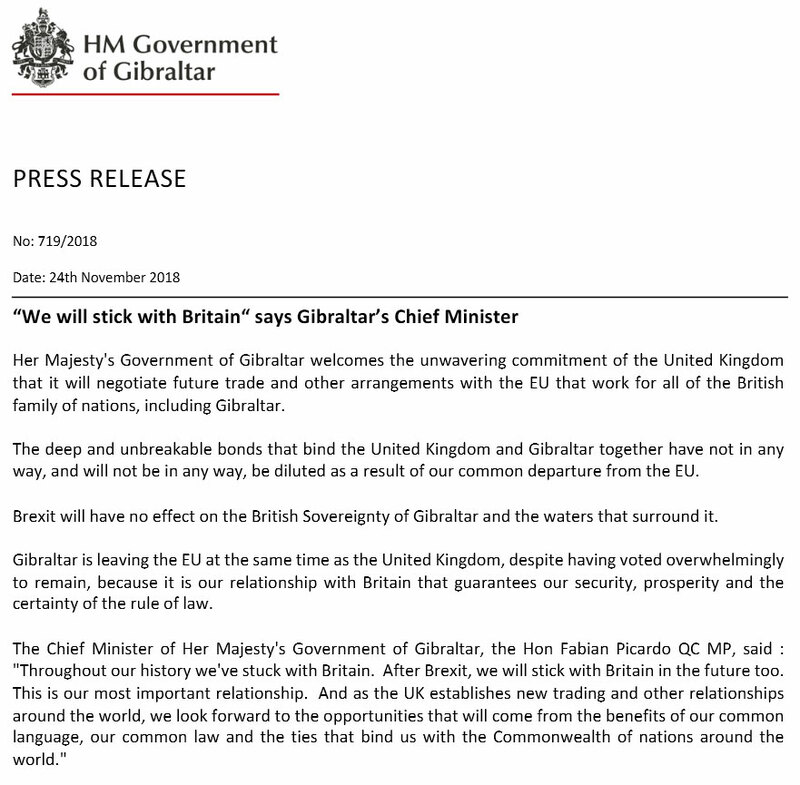 The reaction of the Gibraltarians could have been angry, disappointed, frustrated, or filled with bitter recrimination against May's signal incompetence. It was none of these. It is instead a reminder of the dignity and magnitude of the Rock; geographically it is small, but in the grace and decency of her official response, she towers above the moral pygmies of the EU. God bless you, Gibraltar.